BOSTON - Thursday, August 9, 2017 - Mayor Martin J. Walsh this week joined the City of Boston Scholarship Committee in awarding 35 students $2,500 scholarships to help fund their education. The Scholarship Fund was established in 1995 to provide assistance to residents who plan to pursue a two- or four-year undergraduate program within Massachusetts. 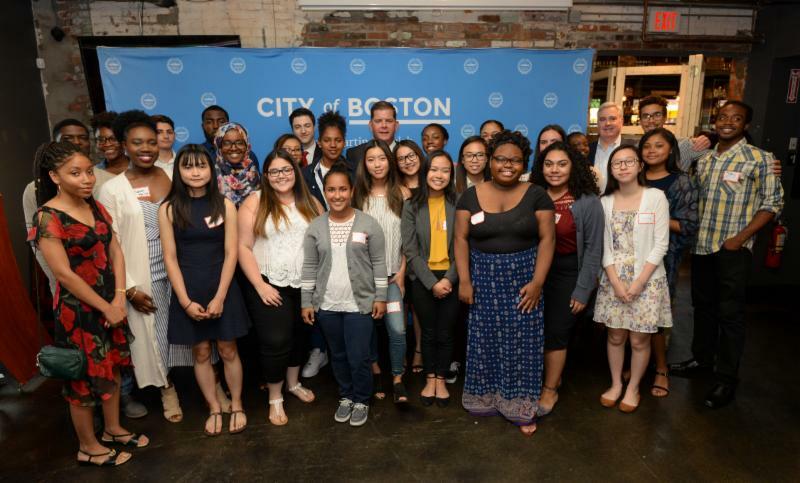 "Each City of Boston Scholarship awardee clearly demonstrates a deep commitment to our community and strong academic promise," said Mayor Walsh. "Thank you for the time and effort you put into sharing your experiences and dreams through the application process. You are the future leaders of Boston, and I wish you all the best as you embark on your higher education journey." Currently, over 100 students receive an annual scholarship of $2,500 through the fund. Scholarship recipients may reapply each year. Applicants must be residents of Boston and have graduated from high school by the time the awards are made in May. The scholarship program, which operates under the authority of a Scholarship Committee, is managed by the Mayor's Education Cabinet. Funds for the scholarships are made possible from contributions made by citizens and corporations. The City of Boston Scholarship Committee has awarded 868 students scholarships since 1995, which totals to almost $2.2 million. This year, Boston celebrated the sixteenth year of an endowed scholarship donated by the Rosen Family in memory of Jeffrey Dunipace Rosen and celebrated the third year of the Community Development Scholarship, established in remembrance of Mayor Thomas M. Menino, and a Community Spirit Scholarship in memory of former public servant and City of Boston Scholarship awardee, Dawn Jaffier. "Being a member of the scholarship committee is one of the highlights of my life. Playing a role in helping fund student's education is extremely fulfilling," said Byron Beaman of the Mayor's Scholarship Committee. "Taking part in the ceremony and meeting the families of these students is heartwarming and the appreciation you feel from them makes reading all the applications worth it." This year's scholarship awards strengthen the post-secondary access initiatives that the Mayor has launched or supported over the last year, including Free Community College Tuition, Boston Bridge and ongoing support activities for students through the Success Boston partnership. "This year, with the help of both uAspire and Success Boston, the Mayor's Education Cabinet and the Mayor's Scholarship Committee began redesigning the fund to better meet students' financial needs," said Boston Chief of Education Rahn Dorsey. "In preparation for next year's process, we will continue to work with college access experts and higher education officials to identify ways to that ensure Boston students find affordable ways to reach - and complete - a postsecondary education." Residents who fit the criteria are encouraged to participate in the 2018 application process, which will begin in January 2018. For more information on the City of Boston Scholarship, visit Boston.gov or send a note to cobscholarship@boston.gov.